4D Cityscape recreates world famous city skylines not only in three dimensions (using scale-model buildings), but also along the axis of the fourth dimension, time, spanning over 100 years of its architectural history! 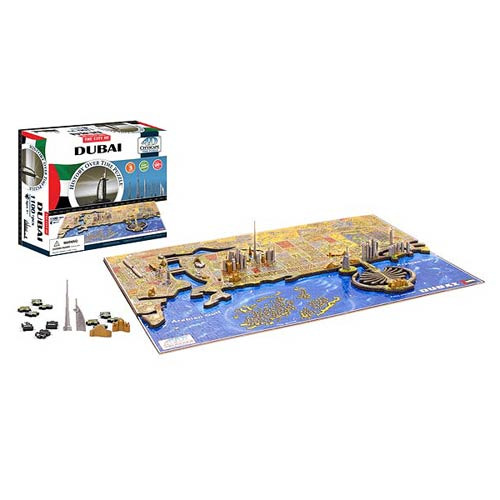 This Dubai, UAE 4D Puzzle includes many detailed plastic replicas that depict the United Arab Emirates city as it appeared as far back as 1800 through to the present and future. Each puzzle includes famous monuments, buildings, skyscrapers, bridges, and more. The streets glow in the dark, emphasizing the city's look at night. Includes a Time Poster that includes a history of the city. The online educational feature includes more than 2000 facts. Ages 8 to 108.